Click here to sign agreement and purchase your 2018-2019 pass! Get some great turns while supporting a great nonprofit! Give back to the mountains while skiing or riding in some of Utah’s finest. 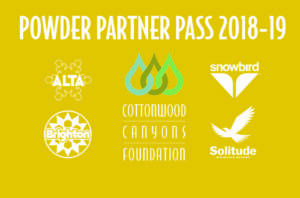 100% of the proceeds from this pass go to the Cottonwood Canyons Foundation. Support education and stewardship programs in the Cottonwoods while getting a great deal on skiing/snowboarding at Alta, Brighton, Solitude and Snowbird! Fully transferable pass – anyone can use it! Pass is fully transferable, anyone can use it! Call (801) 930-5010 or email volunteer@cottonwoodcanyons.org for more information. Passes are available on a first come-first serve basis and are limited in quantity. Click the image above to sign the pass agreement and purchase your Deep Powder Passes for the 2018-2019 season. Thank you for your support and have fun out there!